Announces, some questions and answers. NB: This is Interzone, please use English. For technical support please use @support. List of transactions for the recent fundraising: https://docs.google.com/spreadsheets/d/18AMGH9JaQnEhxE8LsZEQ90RI7pqeM8BbQ3XxpZoXtQs/edit?usp=sharing. Total available: €3,038.22, Paypal fees: €171.89. 94 participants, min transaction €2.00, max €500.00, avg. €34.15, median €20.00. Thank you all! #mokum-budget. BTC: 0.0027 + 0.0047153 + 0.0003072 = 0.0077225 (~25.79 EUR). Dear friends, we've enabled donation page for the fourth fundraising in history of Mokum: https://mokum.place/about/donate PayPal and Bitcoin are accepted. We need to raise €2733 for the next twelve months. Thank you! €500+ has already been donated, and a tiny amount in BTC (so we know that wallet works). Thank you! Morning update: 1348.08 EUR. Thank you all. Evening update: €2312.64 and 0.0077 BTC (~€25 at current rate). 85% complete in 24 hours. ~90 people have contributed. Thank you all! ...and we're done: €2945.67 and 0.0077 BTC (~€25 at current rate). Thank you all. Report to follow in few days. Weirdly, I was just about to ask about this. Thanks for the update! 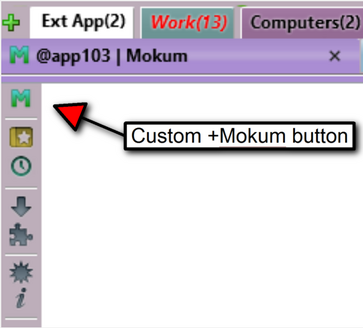 Dear friends, it is now possible to download everything you've posted to Mokum as a single Zip archive. Archive contains machine-readable JSON files in a simple format, containing entries from your feed, your private subfeed, direct messages, image attachments, list of faved posts and your text pages. 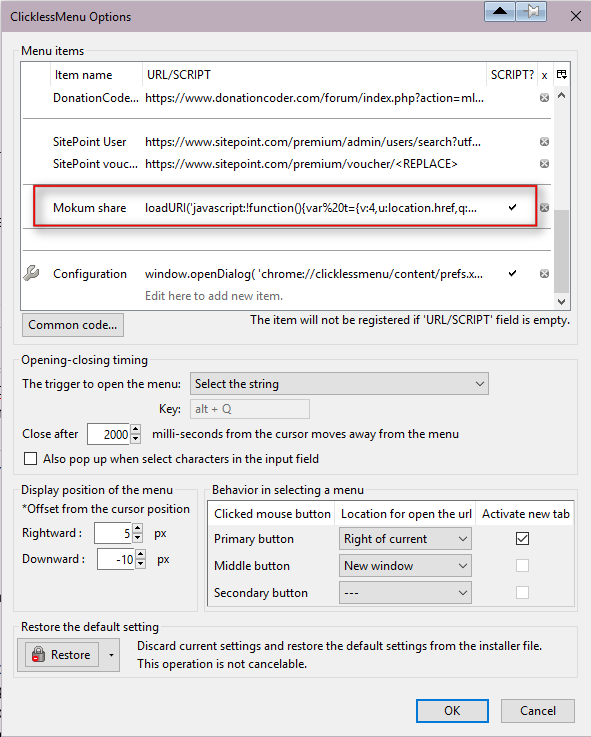 https://mokum.place/takeout This archive could be used as your own backup copy; to create a version of your feed for offline reading; to allow migrating to a different platform or just leaving the service without losing your content. TODO: archives of groups you're admin of [x]; file format description. Dear fellow users of Mokum. We are going to perform two security updates, please expect 5 minutes of downtime very soon. We are going to reboot Mokum servers in order to apply security updates. Two short downtimes expected, 3-5 minutes each. Please remain calm. Exactly three years ago Mokum was opened for the public: /squadette/1. Thank you for your support. WE LOVE MOKUM AND WE LOVE YOU! Thank you! If I ever give Iain Baker that jar of homemade marmalade that I promised him for getting Facebook to reboot the FF servers that one time, then you are definitely next in line for homemade marmalade. You didn't think you could escape this in Mokum, did you? 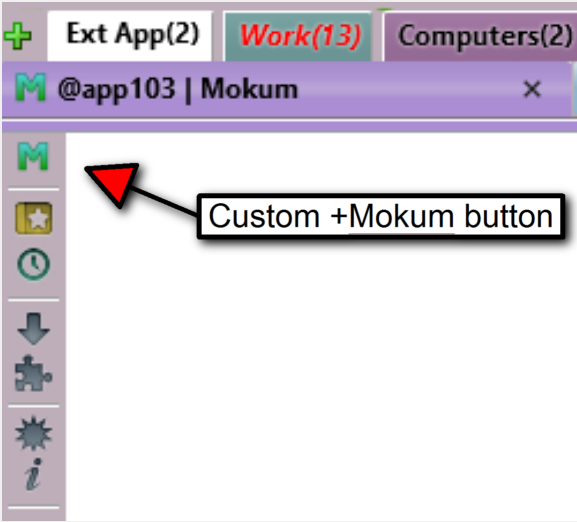 We need to do regular "did you know" reminders about Mokum features. The topic for today is "private subfeed". Please share/translate this link for your community if you think this could be useful. Even if you have a public account, you can have another sub-feed, which is always private. You can enable your private sub-feed on "Settings" page. You can post to your private sub-feed by clicking at "Private sub-feed" link in the right column (or at the bottom, if you're on a mobile device). You can request subscription to other people's private sub-feed if you know its URL. You can invite users to your private sub-feed on your "Settings" page, see "Invite users to your private sub-feed" section. The user must be already subscribed to your primary account. You can see people subscribed to your private sub-feed at your "Subscribers" page. You can unsubscribe people from your private sub-feed there (and they will not get any notification about this). If you're subscribed to someone's private sub-feed, you can see who else is subscribed at the bottom of their "Subscribers" page. If you've had a private feed and wanted to move to having the main feed be public but the subfeed private, is there a way to designate old posts to be private or move them to the subfeed? @spidra: You'd have to do 1 post at a time, but the option is under the "more" menu on every post. I would set up the private subfeed first, invite everyone that you want to allow access to it, then go through all your posts, moving any you want to keep hidden from public view, then when you make it all the way back to your first Mokum post, switch over your main feed to public. @app103: Thanks. Too bad I'm such a prolific poster by mokum standards. Друзья, мы несколько изменили конфигурацию Мокума, чтобы уменьшить наши шансы случайно оказаться заблокированными. Никаких изменений не должно быть видно, но если вы заметили, что что-то сломалось - пишите, пожалуйста! Please remember: if you see something, say nothing and drink to forget. We are going to replace some broken hardware in Mokum server, please be prepared for 15-30 minutes of downtime between 15:00 and 19:00 MSK (12:00-16:00 UTC). We've just enabled so-called "new frontend" as the default. If you have any issues using that, please report to @support. The main visible feature of the new frontend is that you can now add and delete images at any time. This was the most popular item in the current voting round: https://mokum.place/v/top. It is expected that the new frontend should be much faster visually even now, but what's more important is that it allows for more upgrades to faster versions of React.js, removal of a lot of code (which increases page load speed), and of course the new code base allows to add more features. This was discussed back in August (/mokum/1550908), and now it's implemented. Thanks for all the work and the effort! There's no way to search Mokum for comments containing certain keywords, made by a specific user, is there? @random this looks for your *posts* with specified keywords but doesn't show posts where your *comments* have these words. UPD: a funny tidbit is it finds comments in FF archive. Not at the moment, but in the near plans. Hey, we are going to reboot Mokum servers to finalize a security update. 5-10 minutes of downtime expected. Typical search time is now between 1 and 2 seconds most of the time for full-page results, <1 for smaller pages. Few months ago my expectation was <5 seconds. 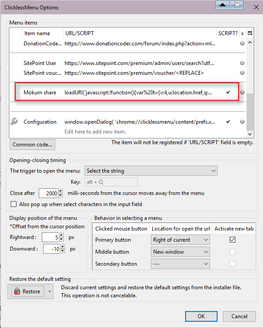 Another Pale Moon compatible Mokum bookmarklet/add-on option: Install Clickless Menu, found here: https://addons.mozilla.org/en-US/firefox/addon/clickless-menu/ Add an entry named "Mokum share" and then add the code found here, as shown in my Screenshot: http://appsapps.info/stuff/Mokum-ID0-1.xml Be sure to put a checkmark in the Script column. The Clickless Menu will pop up whenever you select text on a page, displaying any options that are listed in the add-on's configuration. We're starting to move Mokum to the new server. There will be a brief period when the site will be read-only, and maybe there will be some downtime. Please stay calm. Update: we're running on a single server for now. Okay... as long as it's there when I need it everything should be fine. I see a very small number of occasional errors (two in past 30 minutes). They go away after reload. Heads up: there is a chance that something will break again, but I can't really promise anything.